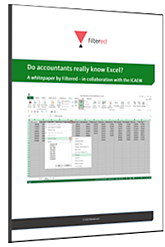 Filtered Whitepaper: Do accountants really know Excel? Microsoft Excel is still business critical. 30 years from its launch, it's more popular than ever: 1 billion people use it, with workers in finance spending a third of their day in the program. Accountants in particular are famed for their advanced Excel skills - but do they really live up to their billing? Our own research of 45,000 professionals, including 12,000 accountants, is the largest and most in-depth study of its kind, and strikes the right balance between high-level insights and useful, detailed training recommendations (including a practical formula to calculate training ROI). Fill out the adjacent form to download your free whitepaper.